Loungewear staples looking a little tired? Here's the antidote. This collection of Wolf & Whistle nightwear uses eye-catching colours and slinky silhouettes to create unforgettable pieces. 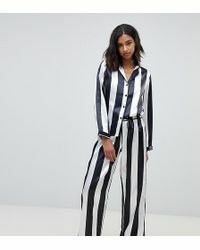 Expect satin pyjama sets, lace-insert cropped styles and striking prints for a head-turning result. Add Wolf & Whistle nightwear to your closet for an instant injection of flattering fits, comfortable fabrics and seductively feminine designs.